The quality of care provided by multidisciplinary staff within our CIUSSS extends beyond any facility’s four walls, into the community, and even beyond. In recognition of their ‘influential’ work in health care, several staff members belonging to the Multidisciplinary Services Directorate were the recipients of awards granted by the Association of Multidisciplinary Councils of Quebec. 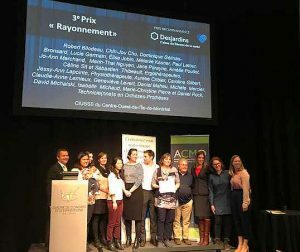 Marc Renaud, an Ophthalmic Technician at the Jewish General Hospital, was awarded second prize in the 2018 Prix Reconnaissance Desjardins “Influence” category, while the clinical team of the Assistive Technology Service of the Constance-Lethbridge Rehabilitation Centre (CLRC) placed third. The “Influence” prizes are given an individual or group who have had an impact in their field clinically, through teaching, research or the evaluation of technology. 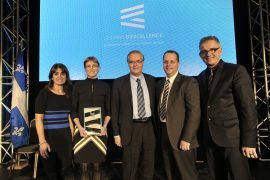 The clinical team of the Assistive Technology Service of the Constance-Lethbridge Rehabilitation Centre receives the Prix Reconnaissance Desjardins in the “Influence” category from Martin Levac, General Manager of Health Networks for Desjardins (left), and Émilie Mercier of the Association of Multidisciplinary Councils of Quebec (right). Team members from left, Jane Parayno, Claudie-Anne Lemieux, Michèle Mercier, Chih-Jou Chu, Dominique Gélinas-Bronsard, Philippe Massicotte, Élise Jobin, Paul Latour, Filomena Novello and Mélanie Kasner. Mr. Renaud was awarded for his dedication in raising awareness about glaucoma world-wide. 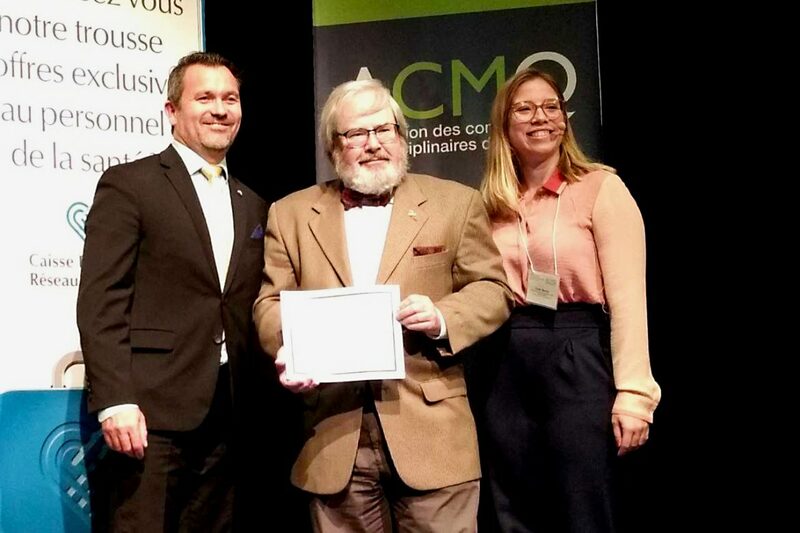 “To be considered for—and to actually receive—such an award reminds you that you are making a difference in people’s lives,” says Mr. Renaud, who is Project Manager for the McGill Glaucoma Information Centre, an awareness and education program for people with glaucoma. Glaucoma is the second-leading cause of vision loss in elderly Quebecers. For 13 years, the centre has held a monthly drop-in clinic for glaucoma patients at the JGH. However, Mr. Renaud has also promoted the education program on a global scale. This has included the creation of two DVDs, available free in all Quebec public libraries, one of which was translated into Creole to support educational projects on glaucoma in Africa. Mr. Renaud has also published magazine and newspaper articles and produced videos about the disease, gearing them to various cultural communities around the world. One such article was translated into 11 languages. “It is my earnest hope that this award will encourage my colleagues to think out of the box by creating novel, exciting and motivating projects for the betterment of our patients and our profession,” he says. 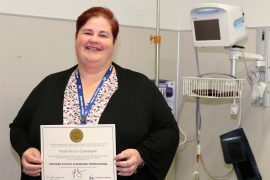 The Assistive Technology Service (SAT) team at CLRC was honoured for their large-scale events with partners and training programs. The team created and implemented a wheelchair propulsion training program to help clients more comfortably master proper driving techniques. The training sessions are based on the common real-life, day-to-day challenges faced by wheelchair users. 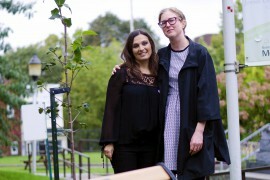 Other accomplishments included organizing a partner day, where 75 rehab professionals from all over Montreal gathered to exchange their expertise on mobility aids through interactive workshops and exhibitions, and a training event on orthotics and prostheses that brought together 50 rehabilitation workers.